**I received an ARC copy of this book in exchange for my honest review**As in her previous series, Ms. Rich is skilled at weaving a multifaceted story with lots of twists and turns, complex world building, and unpredictable characters. Don’t dismiss anything. There is always something important happening even when you think there isn't and I am sure that as the series progresses it will be come more obvious (one could say this is similar to that movie, “Inception”). If you are looking for a quick mindless read this book may not be for you.Throughout the story, Amelia is fighting the darkness that threatens her soul as well as her doubts about the role she plays in saving the Oneiroi. At the same time Seth seems to be battling his guilt about bringing Amelia into his world and his doubts about the future.There are times that you wish they would follow their initial instincts but, in the end, Amelia’s confidence and faith comes through for both of them. I definitely recommend reading the first book in the series, Dreamscape, as it sets the foundation of the world that Seth and his team are fighting for. At first I found the idea of the Dreamscape a bit confusing but as I read on things started to come together – maybe not at that exact moment but a few chapters later I felt like I could begin to make the connections. For me, this quote from the book sums it up well:“It’s not hard to see the connection between the state of the human race and the influence dominating dreams. On a fundamental level, I think most people are good. Some just don’t know how to deal with life, and others are changed by following the destructive path of friends, parents, or even brothers and sisters.”As you read this book, be prepared that there are some things that will remain unknown such as the specifics of Seth’s curse and who (or what) Amelia is. I am assuming that we will find out more about this in the next part of the series. The story is told from alternating points of view and I can appreciate that since it was done from the very beginning. While there is some closure, or progress, in Seth and Amelia’s relationship the epilogue will leave you wondering what is next and, hopefully, looking forward to the continuation of the story. QUICK BITS:One word: WOWCover: Pretty awesome, love the color harmonyOverall: An exceptionally unique world to experienceTHOUGHTS:What another great adventure in the Netherworld! It is nice to see a refreshing world that steers away from the repetitive worlds in most books. This one picks up right where Dreamscape left off. The plot buildup was amazing. It leaves you at the edge of your seat waiting for it all to play out. I loved the bits and pieces sprinkled throughout the book with Seth and Amelia spending quality time together where all of their problems melted away. Amelia is a strong heroine with a dash of sass. It was nice to see her come into her own taking control of her abilities. She has her moments of fear but doesn’t let it get the best of her. Seth brings out the light in her and is always there to provide comfort. He still keeps up his mysterious façade for Amelia but she is slowly cracking his outer shell.With a world as unique as this one, it was hard to put the book down. The story is complex and full of depth and your mind is always wondering what is going happen when certain characters cross paths again. Even with the large cast of characters you are able to keep up with their separate plights and how they all work in the grand scheme of things. The ending just makes you angry because you want more and you are left at the dun dun dun. Can’t wait for the next one in the series! 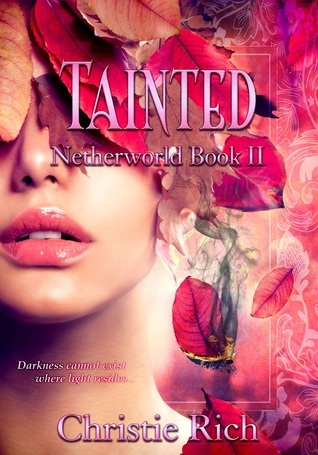 Second book in my Netherworld Series! It's finally here. If you'd like a review copy, please message me!